Researchers at Western University and Lawson Health Research Institute are using tobacco plants as 'green bioreactors' to produce an anti-inflammatory protein with powerful therapeutic potential. The plants are being used to produce large quantities of a human protein called Interleukin 37, or IL-37. The protein is naturally produced in the human kidney in very small quantities and has powerful anti-inflammatory and immune-suppressing properties, providing potential for treating a number of inflammatory and autoimmune disorders like type 2 diabetes, stroke, dementia and arthritis. 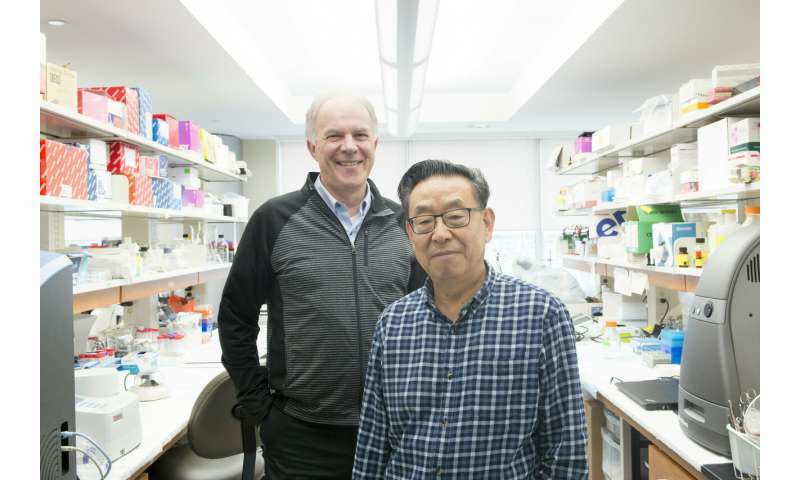 "This protein is a master regulator of inflammation in the body, and has been shown in pre-clinical models to be effective in treating a whole host of diseases," said Dr. Tony Jevnikar, Professor at Western's Schulich School of Medicine & Dentistry and Scientist at Lawson. "The human kidney produces IL-37, but not nearly enough to get us out of an inflammation injury." And while showing promise in animal models, IL-37's use clinically has been limited because of the inability to produce it in large quantities at a price that is feasible clinically. Currently, it can be made in very small amounts using the bacteria E. coli, but at a very high cost. That's where the tobacco plants come in. This work is the first of its kind to demonstrate that this functional human protein can be produced in plant cells. "The plants offer the potential to produce pharmaceuticals in a way that is much more affordable than current methods," said Shengwu Ma, Ph.D., Adjunct Professor in the Department of Biology at Western and Scientist at Lawson. "Tobacco is high-yield, and we can temporarily transform the plant so that we can begin making the protein of interest within two weeks." The researchers have shown in a recent study published in the journal Plant Cell Reports, that the protein can be extracted and quantified from the plant cells in a way that maintains its function. Now that they've shown they can produce the protein in tobacco, it can be translated to other plants, like potatoes. Dr. Jevnikar is investigating the effect that IL-37 has for preventing organ injury during transplantation. When an organ is removed for transplantation and then transferred to a recipient, inflammation occurs when the blood flow is restored to the organ. He and his team believe IL-37 provides a way to prevent that injury. "I hope that this work will impact a change in how people view plants and hopefully this approach will be a way to provide treatments to patients that are effective and affordable," Dr. Jevnikar said.